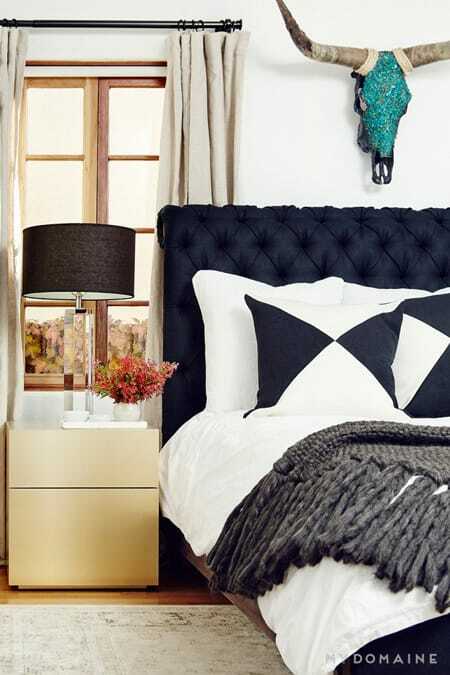 Actress Nina Dobrev has turned her California bungalow into a chic, colorful place to call home. She has given it a hip vibe that is relaxed and sophisticated all at once, embodying a youthful essence that the coastal state is known for. There are bohemian touches mixed with some midcentury modern furniture. Vintage architectural elements with glamorous accents. A youthful vibe with a sophisticated finish. It’s a beautiful collaboration of styles and character. My Domaine gave us the opportunity to tour this inspiring home. It is full of unique touches and charm that are sure to give you some ideas for your own home, regardless of your own personal taste. If anything, it’s an inspiring look at how you don’t have to put your decorating in a box to make it look great. An original fireplace painted in black creates a cool contrast against the white walls and furniture to draw your eye to the focal point. 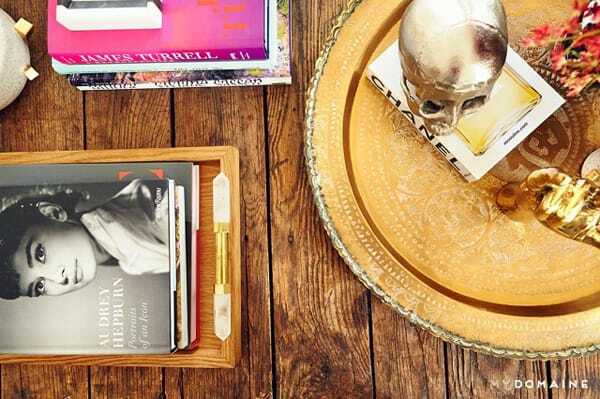 The fantastic end table made from reclaimed wood really grounds the all-white living room. Gold accents bring some glamour to the rustic surface. Two airy, gold console tables bring a midcentury modern appeal to this wall. More modern touches can be found in the dining room which is chic and open. 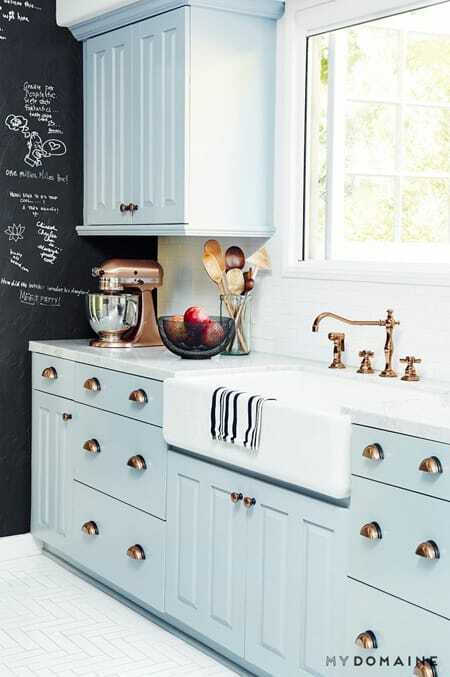 How adorable are these light blue cabinets in the kitchen? 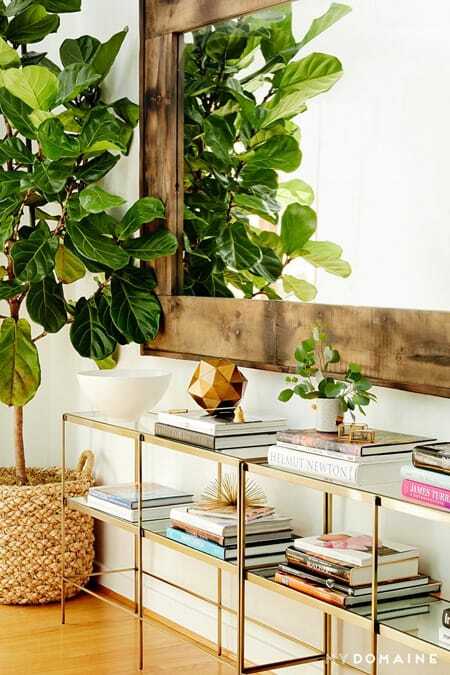 Bronze accents add a luxe look to the space. Peach pillows make the breakfast nook charming and cheery. Deep navy blue accents in the bedroom are relaxing, yet chic as they contrast beautifully against the white walls. Pink wainscotting adds a vintage, feminine touch to the quaint bathroom. 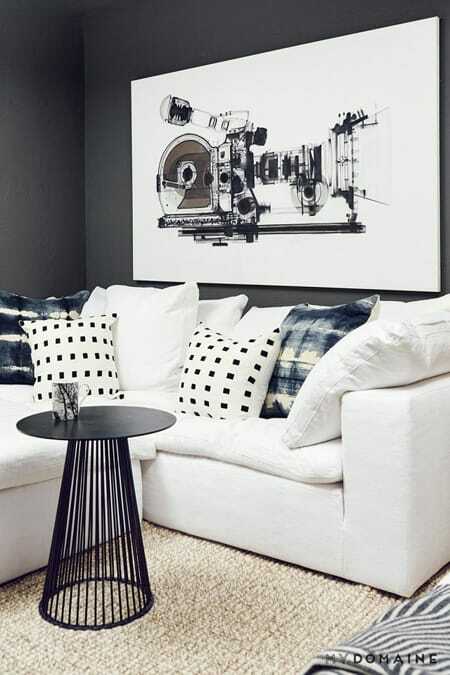 Another hangout space goes for a black and white approach that deviates from the rest of the colorful home. Outside, bright blue walls help create a festive and fun oasis in the backyard. Nina’s home is an inspiring look at creating a space that is all your own.